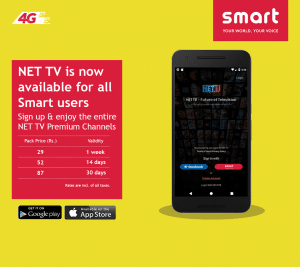 Subscription for Net TV, the first OTT video application in Nepal is now available with Smart cell users. Net TV is also the most popular video subscription application in Nepal. Net TV already lets Nepali users watch TV channels online with Ncell number and Facebook. Users also can log in with ISPs like Worldlink, Vianet, and HONS. The various subscription packs in Net TV to entertain people can now be done in Smart Cell SIM card. To use the service, you can sign up using Smart Cell and watch your favorite contents there. Here are the plan for Net TV in Smart cell. The above rate is inclusive of all applicable taxes. You can either use Net TV app in your mobile or use the web portal for the Net TV streaming.